Note that I call it an "album", even though that term is effectively archaic? Well it feels like an album, the way a record from a past favorite band did when every song was excellent - sequenced logically (with the right opener & perfect closer) and with every mood, fast song & slower song in its appropriate place. 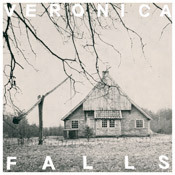 The record in question - which actually does exist on vinyl, but which I've only heard digitally - is the 2011 debut release from the UK's VERONICA FALLS. They're a dual-gender pop band of the highest order. They're raw, they're twee, they're jangly and they're so friggin' good. Veronica Falls popped out a few 45s before this one, and we at The Hedonist Jive were onto them early, right when the blogosphere was shouting about the first one, "Found Love In A Graveyard". Then came "Beachy Head" and then a couple of pre-LP leaks to the press. It seemed to be building things something fierce toward this release, which came out in the US on able popmeisters Slumberland Records. Melodic, even obtusely baroque at times, Veronica Falls come off as The Mamas & The Papas if they'd been deeply informed by the Postcard Records & C-86 scenes. And it rocks harder than the M's & the P's by a country mile - at times dissonant and with a little scorch. Pop fiends who haven't heard this yet are going to absolutely crap a brick when they do. Some of you garage punkers might as well. Go listen to their stuff online and then place your order with the folks at Slumberland once you agree.